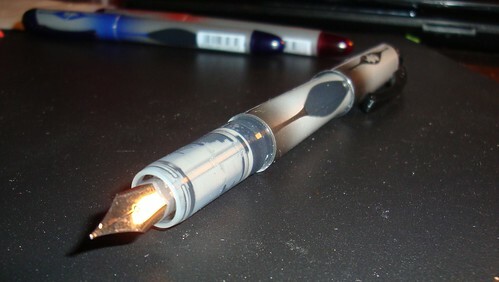 Fountain pens are a writing utensil that I never really had much interest in, and an item that I never really used before. The Bic disposable fountain pens are a great, and cost effective pick up to help spark the interest in an inexperienced customer. There is no easy way to put it, so I am just going to come out and say it. This pen is ugly. The overall design of the pen does not flow at all, and looks fairly awkward. At times I would feel stupid using it in class just because it is so weird looking. It is round and bulgy, really no redeeming qualities looks wise whatsoever. Luckily it writes a little better than it looks. 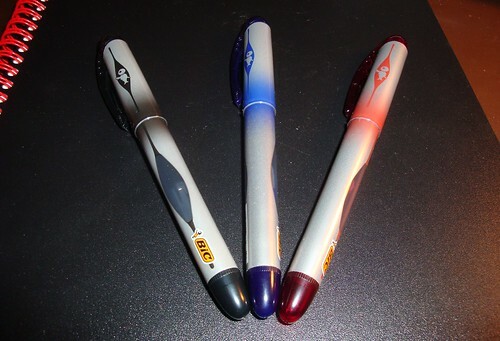 The ink used in these pens is quite nice. The black is very dark and crisp. My favorite color is the blue, it is unlike any ink I have ever seen. It is a lighter hue, and has lavender hints to it. The red color is disappointing. I wouldn't even call it red, it looks more like an orange than anything. When I first used it I thought there was something wrong with it, maybe not getting the proper ink flow. That was not the case though, it is just a very strange color. The best way to describe how these pens write is inconsistent. The black variation was the best of the 3 giving smooth crisp lines always. When I would switch to the blue it would feel very scratchy. I do not know if it had anything to do with the ink, or maybe if I got a slightly defective pen. The red also wrote well, but I hardly ever use that due to the odd color. Paper is also another big factor in using this pen. For class I use a cheaper store brand notebook. The pens do not perform well on this paper and give very inconsistent lines, and an inconsistent feel while using. Another downside to the cheaper paper was the bleed through. 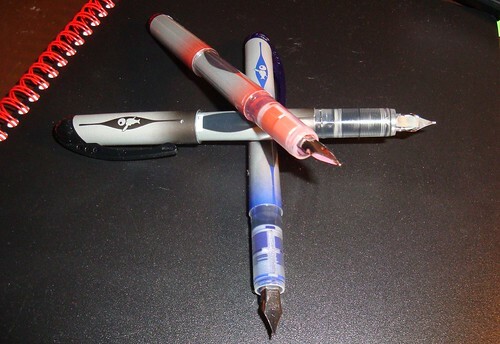 These pens bleed like a stuck pig on cheaper paper. While doing my review I used a black and red notebook, and there is a considerable difference.The Bic flows much nicer, and allows much less bleed through. Overall these pens were disappointing. I was expecting a supreme writing utensil, and I did not get that. 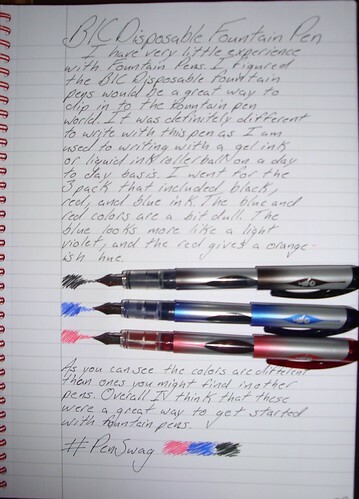 I would suggest that if you were going to try this pen you would have nice paper as well, and to not bother in getting the red variation.